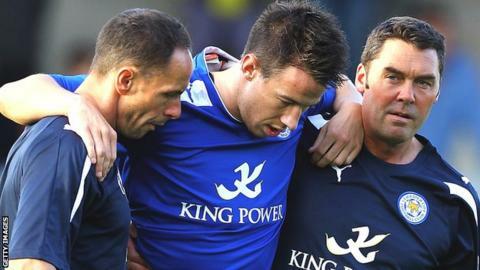 Leicester City defender Sean St Ledger will miss the start of the new Championship season and could be out of action for up to eight weeks. The 27-year-old suffered a medial ligament strain in the early stages of Wednesday night's friendly at Burton. St Ledger joined the Foxes in June 2011 from Preston North End. The Republic of Ireland international, who scored against Croatia in this year's European Championship, has made 32 appearances for Leicester. It means he will miss his country's opening World Cup qualifier against Kazakhstan.